In Books Tagged In Antisemitism, Books on Quebec, Holocaust, Jewish History, Jews, and Montreal. 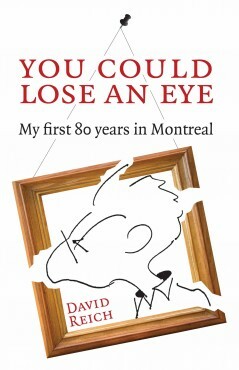 You could lose an eye, My first 80 years in Montreal by David Reich is an inspiring, sometimes heart-rending, life story by a man whose tongue is always in his cheek. At 82 years young, David Reich offers readers a delightful insider’s view of Montreal’s vibrant and historic Jewish community as well as a powerful description of what happened to relatives who were left behind in Eastern Europe. He has graced his book with many vintage photos and some historical documents, and he even promises a sequel, My second 80 years in Montreal. “You Could Lose an Eye” is the expression David Reich’s mother often used for those she loved. It is the story of a family’s transition from the wretched oppression they left behind when they arrived in Montreal, where they had only to learn new languages and adapt to a new political, economic and not always welcoming social culture. It recounts the laughter and the tears, the triumphs and the failures as Ma established her dynasty, as Pa built his business and as their firstborn carved an architectural career. All was possible for those who took root in a free world. They were the fortunate ones who were allowed to aspire and succeed, and to keep alive the memories of those who were denied entry and paid the ultimate price for being Jews. YOU COULD LOSE AN EYE in the Montreal Gazette, Friday, January 28, 2011. “Engaging, evocative arrangement and narration of people and circumstances. I LIKE IT!”— Aniko Koranyi, Past-President of Canadian Authors Association (Montreal branch). David Reich was born and seasoned in Montreal; his parents were immigrants rich only in their heritage and appreciation for their adopted country and its opportunities. David Reich abandoned a sixty-year career in teaching and architecture to enjoy the pleasures and disappointments of writing. Copyright © 2019 Baraka Books.